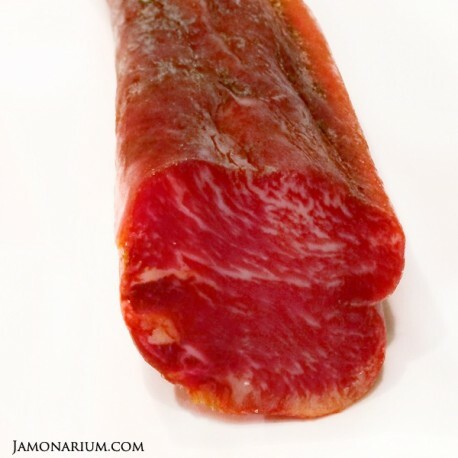 How to recognize a good Lomo Iberico bellota? 1. 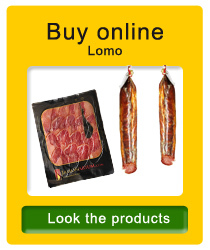 What is Lomo Iberico? 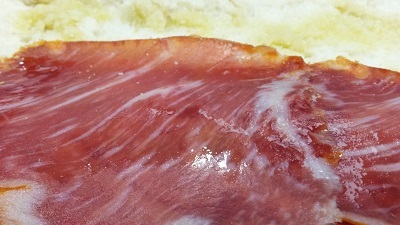 Lomo is an Iberico cold cut extracted from the back of the pig. This cylindrical piece is free of external fat, and it is also considered one of the most valuable and appreciated meat pieces from the animal. Lomo iberico is presented marinated and stuffed into natural casings pig. It is usually about 60 cm long and weighs an average of 1-1.2 kg. This cold cut has a characteristic intense and natural flavor, tight texture and strong aroma. It is red, fainter in the outside and more alive inside. Its internal aspect is characterized by a kind- of-marble appearance caused by the fat it contains.This fat marbling, which is a characteristic feature in Iberian pigs, is generated by the acorn feeding (bellota) that the animal has had. Lomo is considered one of the most natural meat products that exists as it is not subjected to any manipulation, except the marinade with paprika. This is the main difference it has with other cold cuts as chorizo. While the first one is whole meat cured inside the animal’s gut, the second one previously is minced and mixed with fats. 2. How to recognize a good Lomo Iberico bellota? Pleasant aroma and smooth texture on the palate that takes us to the most traditional parades. There are different types of lomo depending on the diet the animal has had (which will determine product quality) or manufacturing process. As it is a sausage (cold cut) that comes from the Iberian pig, its quality will depend on the feeding the animal has received (as well as happens with Iberico ham). 1. 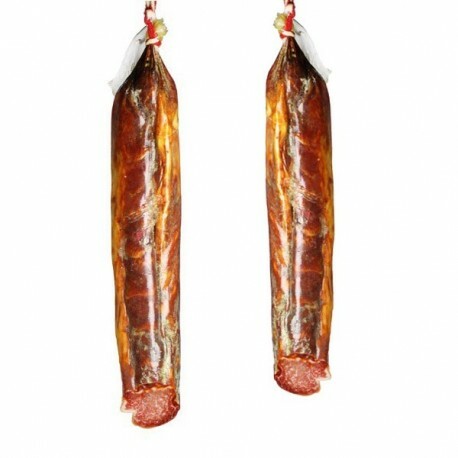 Lomo serrano: comes from white pigs that are bred in farms and their feeding is exclusively formed by regular fattening. This diet combined with reduced physical activity due to limited mobility, lowers the quality of the product in comparison to the one that comes from the Iberian pig. 2. Lomo iberico: comes from the Iberian pig. The main difference between this type of pork and the Iberian bellota one is the diet. This pig does not eat acorns, just fodder. 3. Lomo iberico bellota: this type of sausage comes from Iberian pigs breed in freedom in the dehesas feeding exclusively from acorns during the fattening process (where they have to perform physical activity to find food). This combination of diet and exercise cause the product from this animal is so appetizing. We can distinguish two types of lomo iberico de bellota: Lomo iberico rojo (traditional and popular one) and white (natural). The only major difference between the two types is the ingredients used in the marinade. Their preparation is the same ad both are from the same animal and from the same part of it. Red lomo de Bellota: it is the most consumed and therefore the most popular. Its reddish color is due mostly to the marinade used (since one of its main ingredients is paprika). White lomo iberico: there is no paprika added during the marinade process, so its development is smoother (performed only with black pepper, garlic and salt). Bondiola: is traditional from Argentina. The pig meat is compacted within a membrane formed by a bundle with strings. Usually is seasoned with salt and pepper, but occasionally it is also added nutmeg and paprika. 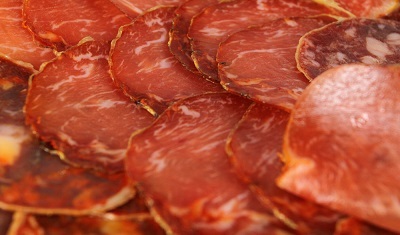 Capicola (also known as capocollo or coppa): comes from Italia. Pork loin meat is seasoned with red wine (sometimes it can also be white wine), garlic and different spices and herbs that differ depending of each region. Afterwards the meat salted in a traditional rubbed massage and stuffed into a natural casing. Finally, it is hung up for about six months to cure. As it happens in Spain, it is a very valuable piece in Italian cuisine and also in borderline regions of Switzerland with this Mediterranean country. When it comes to prepare lomo it is needed a lomo iberico and various condiments and species such as salt, paprika, garlic, oregano and olive oil. Once it has been removed the piece of pork (located next to the spine and under his ribs), the piece is meticulously cleaned by removing all exterior fat. After that it is maintained for 24 hours at temperature between 0 and 21 ° C.
Afterwards, it is salted, being left to stand in the cold between 5 or 6 degrees for one or two days depending on the weight of the piece (half day per kg). Once salting time has passed, the pieces are desalted by washing them in cold water and having a brushing process. They are left in camera for one hour per day that they have been salted. They drained dried during a couple of days until the piece is well dried. For the marinade a paste composed of paprika, garlic, oregano and olive oil is prepared. Once the piece is marinated, is left hung up to 4 or 6 degrees for a couple of days (about 48 hours). This whole marinade procedure is performed completely handmade with natural ingredients. Finally, the marinated piece is stuffed into a natural or artificial casing. The piece is tied hard and hangs on a drying room where it will be processed to make the healing process (known as “estufaje”) that is performed at 18-20 degrees Celsius and 80-95% relative humidity for two days. Once this time has passed, it is time to cure the piece in heated warehouses where there is a temperature of 12 - 15 ° C and a relative humidity of 75/80%. There is a very strict control of these parameters in order to ensure a high quality Iberian pork loin. This drying time may vary between one and two months. We should highlight the fact that there is no exact proportion of condiments when making the marinade, since in most cases depends on the producer. However, in the market there are preparations in order to make some cold meat flavoring. Only you need to read the label carefully and follow the instructions which indicate how much of the product is added per kilo of meat. Lomo is an excellent food not only because of its delicious taste but also for its rich nutrient content and low comparative proportion in fat, calories and cholesterol. After steak, pork tenderloin is the part of the animal with more protein and less fat, which make it perfect for those who barely eat meat. In a nutritional level, its high protein content relative to its low fat and carbohydrate content is one of its most important characteristics. Per 100 grams of pork loin, 50 grams of protein are obtained and only 8 of fats. Therefore, it is a highly recommended food for muscle development becoming a perfect ally for athletes. Rich protein foods are recommended in stages in which a greater intake of this nutrient is necessary, such as pregnancy, childhood and adolescence. It is also a perfect aliment for those who follow a diet high in protein and low in fat. A lomo sandwich is ideal for athletes, children and people whose work is physically demanding. Lomo is rich in vitamin B3 (100 grams contain 12 mg of vitamin), which is beneficial for the circulatory system. Moreover, this vitamin sometimes helps to reduce cholesterol. This meat is usually recommended to combat diseases such as diabetes or arthritis. It is also a food that has a high amount of vitamin B1 (0.67 mg per 100 grams). Foods rich in this vitamin are recommended during periods of pregnancy and lactation, as well in postoperative or periods of convalescence, since there a great vitamin wastage. Surprising as it may seem, sometimes it can even be a good ally to combat stress and overcome depression. Lomo iberico is an aliment full of benefits, but if your blood cholesterol level is high, it is preferable to eat it with moderation. The same applies to people who suffer from hypertension, fluid retention, or are following a low salt diet, because it is a food rich in sodium. It can be purchased whole or in pieces. It is a cold meat that is eaten raw, cut into thin slices that can be eaten in sandwich or served as a tapa or bar snack. Lomo combines perfectly with tempranillo wines, especially if they are vintage. 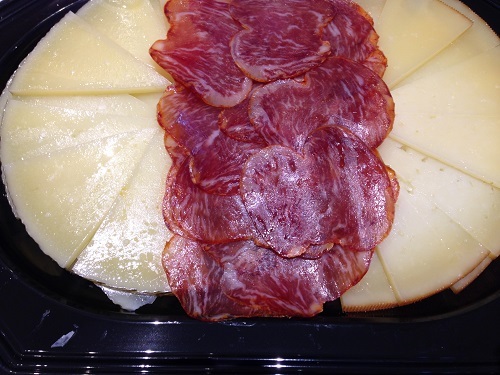 Fino and Manzanilla are also a good companion for this rich cold cut due to their capacity of balancing flavors and cleaning the palate between mouthfuls. Even a strong white wine would be a good pairing option. It can also be accompanied with mild beers in order to counteract the intensity of flavor. Black beers of certain bitterness are also a good choice. Cheese, especially goat or sheep curds, combines perfectly as they have some acidity in taste which accompanies pretty well the intensity of lomo. 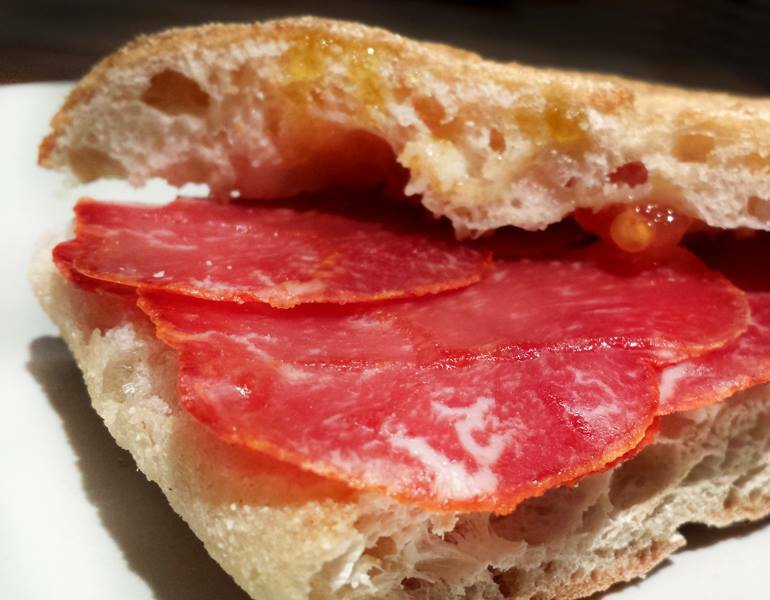 Usually is recommended to eat lomo iberico as a tapa or in a sandwich. However, we relate you some easy and tasty recipes to enjoy it in all its fullness. Ingredients: Bread toast, sliced ​​lomo, cream cheese and pepper. Preparation: we put over the toast pieces of lomo. Then we add some cheese over the cold meat. We introduce toast in the microwave a few minutes until we see that the cheese melts. Once outside, before serving we recommend to add a final touch of pepper to taste and enjoy! Ingredients: Lomo iberico cut into thin slices, Parmesan cheese, extra virgin olive oil and balsamic vinegar reduction. Preparation: we serve the lomo iberico bellota as if it were a carpaccio to use. Above we put a Parmesan cheese chopped in small pieces, olive oil and finally the vinegar reduction. Ready! 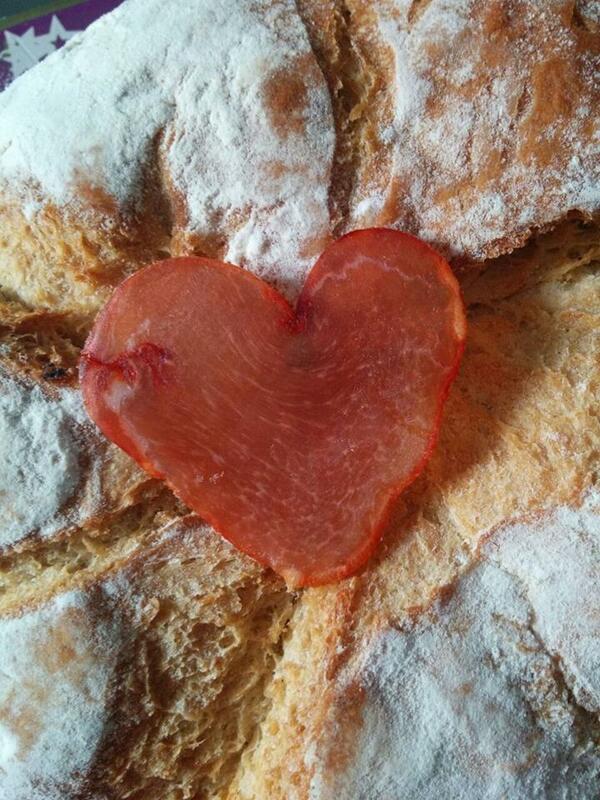 Ingredients: bread, lomo iberico, cheese curds, olive oil. Preparation: Open the bread in half, add oil to taste and then sliced ​​cheese and lomo. They're a perfect match! A hot sandwich would be a delicacy, but in this case we suggest changing the semi-cured cheese for one with a creamier texture. That will make easier and tastier the preparation. Ingredients: pizza base, tomato sauce, oregano, cheese, ham and lomo. Preparation: We extend pizza dough and tomato sauce over the entire surface with a spoon or knife. Then we put the ham cut into small pieces, sliced lomo and cheese sprinkled on top. We add oregano as a finishing touch. Preheat oven to 180 degrees and once ready introduce the pizza about 15 minutes or until it is ready. Carefully remove it from the oven and cut into those popular and typical triangles. Yummy!